Go Green with a Soda Fountain! 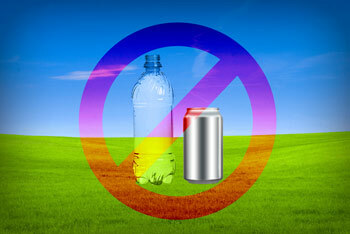 Are you still buying soda (or other beverages) in bottles and cans from the grocery store? Sure, it's convenient - particularly if you're making a last-minute stop to pick up party supplies. However, if you're buying bottles and cans regularly, you've certainly noticed some of the negative aspects: carrying heavy cases of cans (Don't drop 'em! ), the amount of space they take up in the refrigerator, how long it takes to cool down a case of cans (or a couple 2-liters) in the fridge, and how quickly they fill up the trash can (especially if you don't crush them, first). Let's not overlook one of the biggest disappointments with canned and bottled soda: the taste. It's just not the same as a crisp and refreshing soda freshly poured from a fountain. Period. You know it and I know it. We even ship our small systems in second-hand boxes from the manufacturer. Recycling is good, but it could be better. "How? ", you might ask. Quit buying soda, tea, lemonade and juices in bottles and cans—Easy peasy! It really doesn't get much simpler than that. Soda fountains eliminate the need for bottles and cans. Bag-in-Box syrup (used in post-mix soda fountains) is very efficient and produces less waste than it's equivalent in bottles and cans—just one 5-gallon BIB of syrup makes as much soda as 192 20-ounce bottles. The green doesn't stop there, either. There's money to be saved by having a soda fountain! When you buy canned and bottled beverages, you're also paying for the mixing of the beverages (syrup and carbonated or plain water), the container itself, and the transportation from the bottling plant to your local grocery store. Around 802,000 tons of PET plastic bottles were recycled nationwide in 2011, but more than twice as much PET was wasted: 1.9 million tons. "The Great Pacific Garbage Patch, also described as the Pacific Trash Vortex, is a gyre of marine litter in the central North Pacific Ocean located roughly between 135° to 155°W and 35°N to 42°N. The patch extends over an indeterminate area, with estimates ranging very widely depending on the degree of plastic concentration used to define the affected area. The Patch is characterized by exceptionally high concentrations of pelagic plastics, chemical sludge, and other debris that have been trapped by the currents of the North Pacific Gyre."